Move to Contact: Erfundensdorf, Game 3. Still campaign turn 1, but the third game of the morning’s advance. Table 3 is through the Eisenwald forest, west of town, along a forester’s track, where the trees meets the farm fields that surround the town itself. 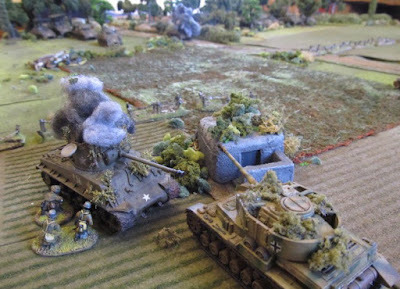 The Germans have a blocking force in place (defending again), with the US Task Force Hallas of CCA, 3rd Armoured attacking. Before the start of the campaign both players used a master list of core forces to pick battlegroups for each US route of the advance and German defensive area. The master ‘core’ list was long, over 3,000 points, and some of those forces had to be designated as the reserves, which can be drawn on later in the campaign (if needed), but can’t be used in Turn 1 (you have to have something left to fight tomorrow, even if in the campaign, there is no actual tomorrow). For the Germans these are the forces either still in town itself (no doubt hiding from US shelling) or en-route as extra reinforcements - a unit designated as ‘Panzer Ersatz Kompanie 12’, or Stossgruppe Schulz, mostly trainees from the Paderborn tank training ground (but with the Panthers). That force doesn’t arrive, via Table 5, until campaign turn 2 (the afternoon). 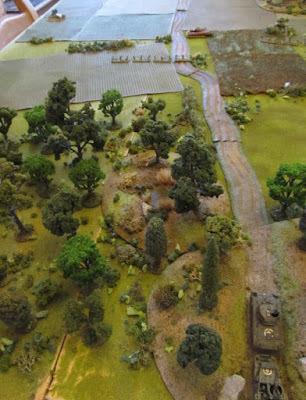 If the US forces can breakthrough to table 5 in the first turn (via table 4) they can attempt to incept the arriving reinforcements in a meeting engagement. If not, then Stossgruppe Schulz will make it into town and be able to either counter-attack or help defend the town in the big final battle (turn 3 of the campaign, the evening). In this game, the US forces of Task Force Hallas were pre-chosen up to 700 points, and any points not chosen could be used for adding off-table artillery support, via any method of calling on the guns they liked. In the end, the US player just spent all 700 points on the following attacking force from his core list, using another one of his six armoured infantry platoons (this time mounted), some Sherman platoons from the full battalion he has to call upon and his battery of Calliope rocket launchers (he only has 1 of them thankfully) and added a supply truck. My defenders, elements of Kampfgruppe Idlemann, are holding the line in a Defence Line scenario. 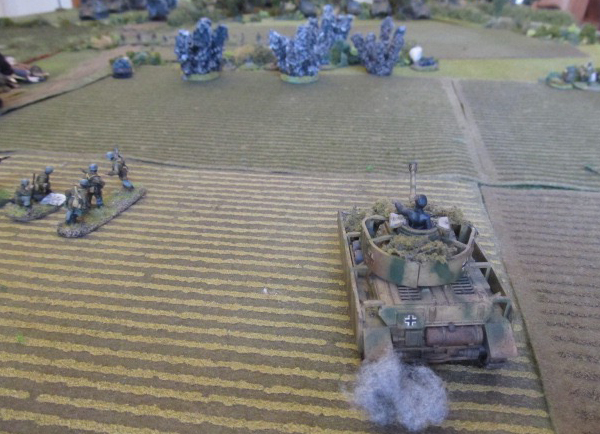 Infantry is from Fallshirmjager Training Battalion ‘Richter’ (sub-ordinate to Kampfgruppe Idelmann), one of three FJ platoons in the core lists (and one was already all but destroyed in game 1). Added to this from the core are 2 of my Panzer IVs (I have 3 in all), but at last some proper tanks. 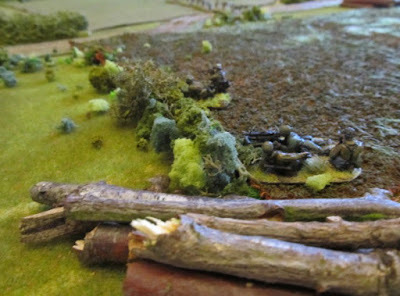 The pre-deployed defences are barricades (log piles), a gun-pit, some foxholes and my command bunker (on the edge of town). With a few points leftover from the core stuff, I added an off-table battery of 81mm mortars and a single timed Nebelwerfer strike (duel of the MRLs). Time to get it on (and try to win one). Victory for the US would open up a deployment zone west of town in the final game. If I won, then I could chose to counter-attack here, if I had the forces in campaign turn 3, or just be content that that side of the town was blocked off and I wouldn’t have to face Task Force Hallas and their Calliopes again. 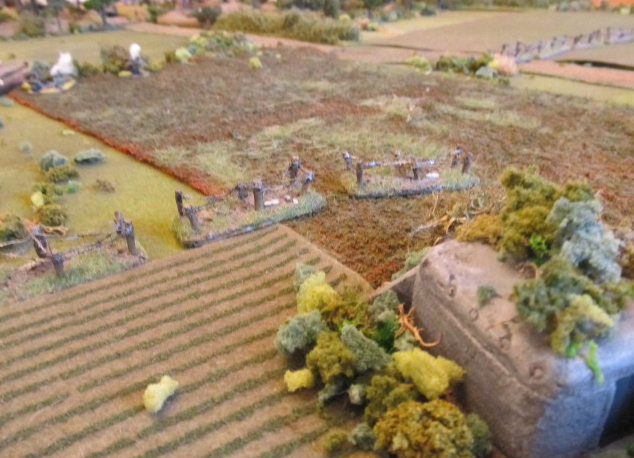 The battle itself was an attritional affair. 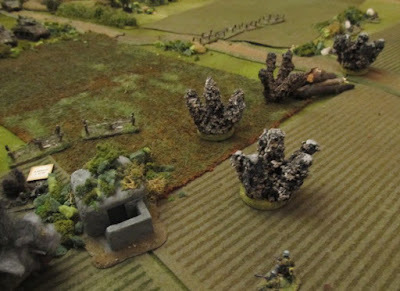 My FJ dug-in and holding tight, mostly on ambush fire awaiting targets for their Panzerfausts (there were very few for the MG-42 teams). 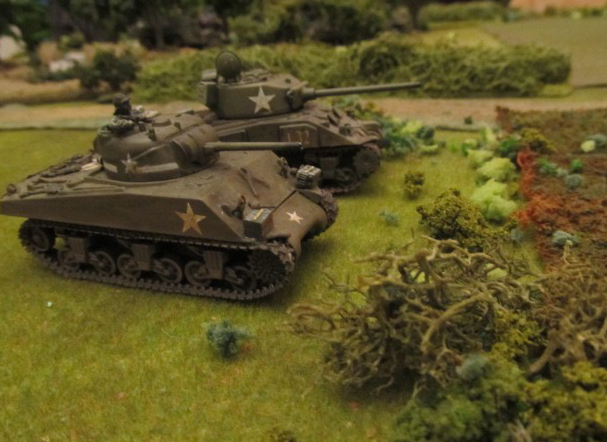 An initial rush by the US for the HQ bunker gained ground, but when my Pz IVs arrived, ‘112’ knocked out the Sherman and my FJ mopped up the few US infantry pinned by the bunker. That objective was saved and secured. Meanwhile, the US moved up through the trees, and my mortar support fire failed to show up, failing 3 comms test in a row (and about 6 in the game)! 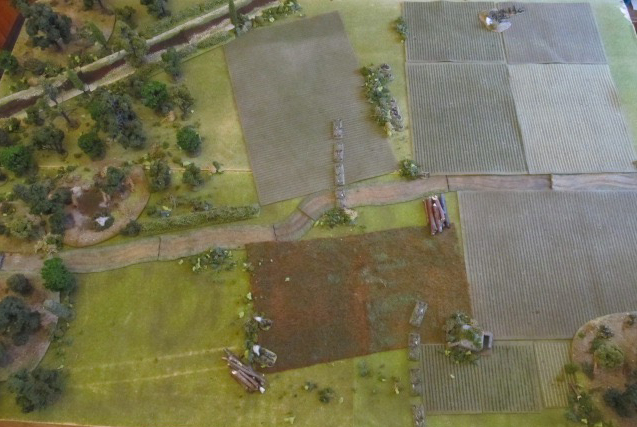 The Calliope battery moved to the woods edge on my left (we decided they couldn’t shoot from under the trees), and the FOO tank was on the road trying to get a clear line of sight to the main defence line without being targeted by the PAK-40, dug-in on my right. The PAK awaited on ambush fire, and when tanks appeared at the tree line, opened fire, with 3 shots from its loader team - and subsequently failed every spot roll! 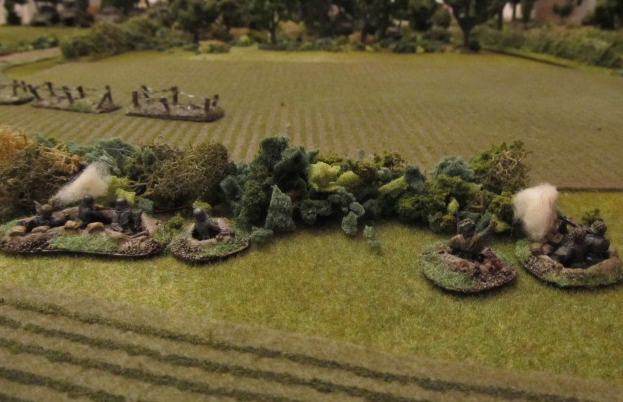 The Calliopes roared into action and, well, beyond a bit of pinning, had little effect on the FJ in foxholes. Phew! My own timed Nebelwerfer strike was similar in effect, a bit of pinning on tanks, but no direct hits! Not a banker then. The US sat off, blazing HE and MG fire into my defenders trying to get them well pinned, with M3s loaded with infantry ready to go when their chance came. 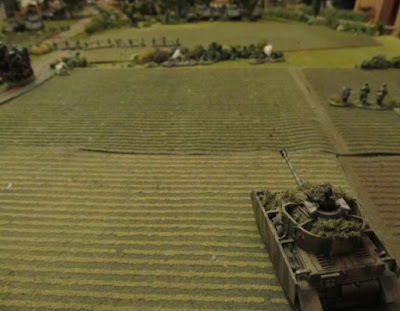 My Panzers fire, missed and, with the few hits, glanced off! Good grief. For once no US fighter bombers showed (although 2 counters were drawn, neither dived in). The tank duel just used up ammo, with only 1 casualty, the FOO’s tank on the road being knocked out by ’112’ again, it as fighting this war on its own. 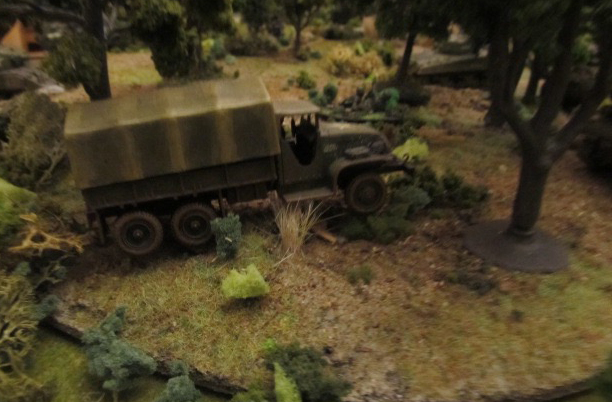 The US had a supply truck in the woods, rearmed the Calliope and then the tanks rolled in to collect more shells. 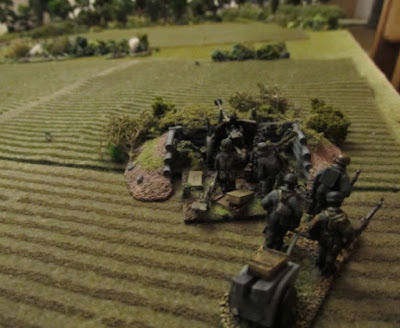 I strengthen my line my FJ pioneer squad, dashing up the road in their truck, which was then destroyed by a 75mm HE shell before it could get away again. The attrition was favouring the US, one of my Panzer IVs had been immobilised by an AP hit and was now also out of ammo. 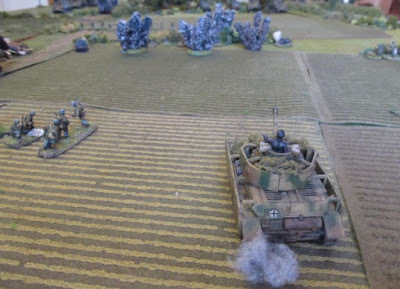 The PAK scored a kill, on an M3 half track, but it wasn’t enough. 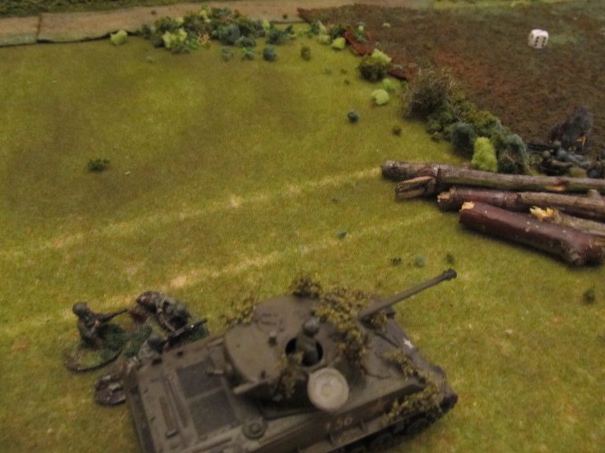 With his tanks re-armed he finally (after turns of waiting) attacked. 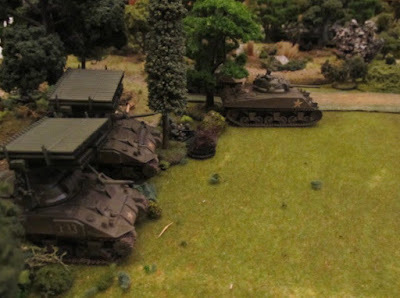 Those Detroit-engines roared and the M3s advanced, Shermans adding HE shells to help keep my FJ heads down. A second Calliope strike, well placed, caused havoc and more pinning. 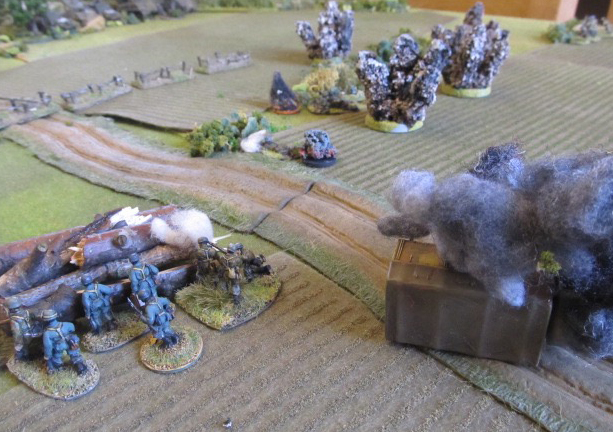 A HE shell destroyed the Pak-40 (another 1 rolled for a cover save!). One Sherman was hit in the flank by a Panzerfaust from my pioneers, and his leading M3 suffered the same fate, his pinned infantry dismounting to then be flayed by MG-42 fire, but not wiped out. Both sides counter stacks had raced up, and my break-point was approaching. Another turn in the assault saw his PHQ half track race up and wipe out my FJ platoon HQ, trapped in the open having been pinned by Calliope rockets. Pintle-mounted .50 cal fire broke them and my battle group… the US were still 12 points away, so another solid win. Crickey! If something doesn't improve soon someone's going to get shot for dereliction of duty! 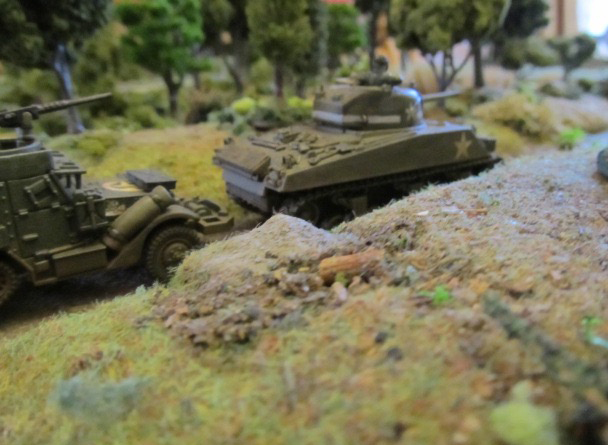 My FJ platoons had suffered half losses, as had his armoured infantry, both my Panzer IVs would have to be abandoned (both had been immobilised by the end). 3 Shermans were wrecks, but theer are plenty more where they came from. Task Force Hallas had forced its route into town… I’m started to look very surrounded. On to game 4… can I actually stop the US in any game? Table 3, Eisenwald Forest, foresters track and farm fields west of town. US attacking left to right. HQ bunker's view across the fields and barbed wire. My main mortar spotter, his radio blew 6 from 10 comms checks... and no re-roll either! US probe force, following the trail. FJ outpost watching the track, MG-42 team and Panzerschreck team. View from the US table end. 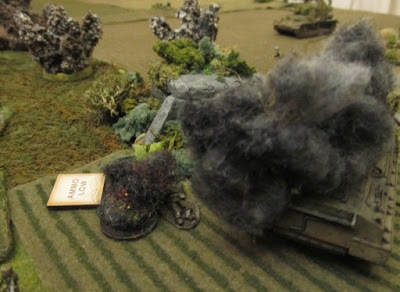 First US probe, takes out the Pzschreck team and pins the MG before making for the bunker in a lightning 'coup de main', that almost came off. Resupply truck open for business in the woods just behind. Foxholes of my veteran FJ, awaiting on ambush fire. Dug-in PAK-40 and loader team with long fields of fire. My first Pz IV arrives from town. Calliope impact, doing surprisingly small damage. US tanks open fire at long range, a lot of AP was wasted and bounced-off, something you can do it you know the supply truck isn't far away. The rush for the bunker ends, Sherman KO'd, MG team now low on ammo and pinned. Pioneers arrive from reserve, dismount just before their truck is vapourised by 75mm HE. 112, my star tank, duel with 2 distant Shermans, and getting repeated pinned by glancing hits. Good Krupp steel! Not so tough crew. Meanwhile '113' is immobilised in the fields. Calliope impact ahead. US attack on my front lien overwhelms them, but not without losses. I can't help but think, the PAK crew running cost me dear here, but then, whilst it was active, the US were not going to rush me. 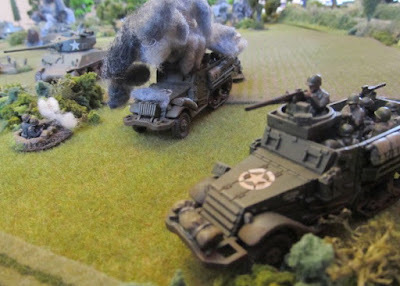 HQ half-track's .50 cal did the final damage. You appear to have the same luck as I do, what the lady giveth she taketh away two fold. Entertaining read none the less. I can't buy a break atm Phil, at least the plane's didn't show. It must turn soon. Hi great report! However im curious about how effective you find direct HE, are machine guns not the better option ( if the vehicle has them)as they dont have ammo count? Our club changed the rules slightly with HE and made it reduce cover save to 1 point less.